Some people want to jump right into training for a full-distance triathlon. That’s 2.4 miles of swimming, 112 miles of biking, and 26.2 miles of running! We strongly discourage first-time triathletes from starting with this type of distance. It’s always best to test out the waters first before taking on such a huge endeavor. See the reasons below for why you should make your first triathlon a sprint triathlon. When you’re done, register for Rookie Triathlon and let the training begin! Triathlon training takes up a lot of time. With three different sports to prepare for, you could triple the amount of training needed. Starting with a shorter distance triathlon allows you to understand how much time is needed for each discipline. Going for something longer in the beginning and not realizing the time it takes, could set you up for disappointment and failure. If you’re interested in triathlon, chances are you have a swimming, cycling, or running background. That’s great, but you’re about to request a lot more from your body when you train for a triathlon. You don’t know how you’ll respond to the different elements of training. Making a sprint triathlon your first triathlon will allow you and your body to adjust to the rigors of triathlon training. Chances are higher that your body will respond positively to the increase in training. Signing up for a sprint triathlon means you’ll have a shorter training runway, which can reduce burnout and get you closer to race day. For a first-time triathlete, the mental aspect of training is just as vital as the physical. From a training standpoint, you’re asking less of your body. From a mental standpoint, the shorter training timeline allows you to reach your goal of the finish line sooner! The more you train, the more you run the risk of injury. Training for anything can lead to injury, especially if done incorrectly. But when you extend your training timeline, the chances for injury greatly increase, especially from overuse. Training for a sprint triathlon is perfect, especially if your body isn’t completely ready to handle the load of full-distance triathlon. 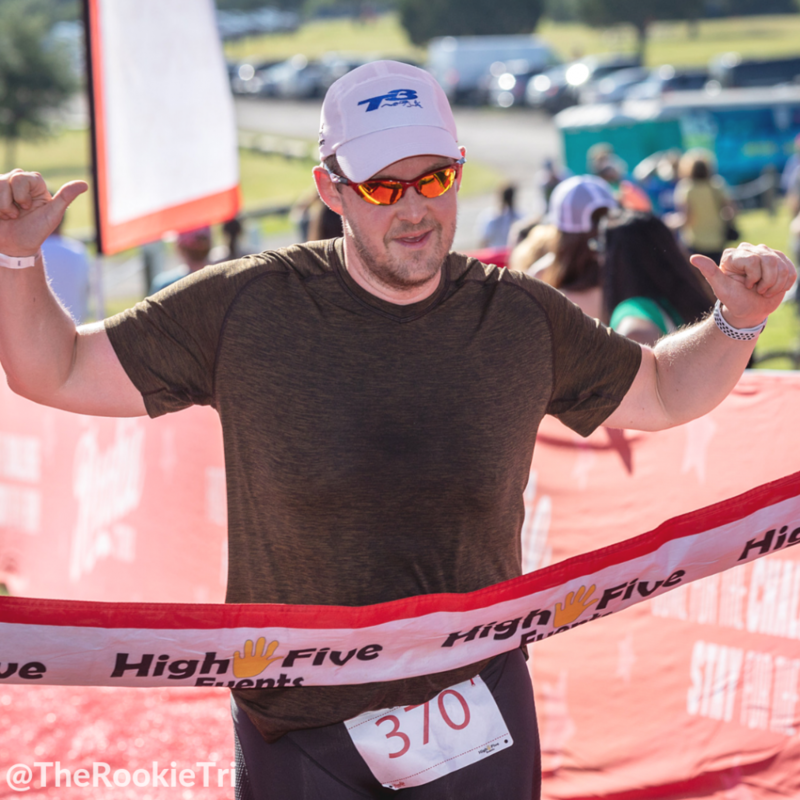 The Rookie Triathlon is perfect for first-time triathletes. You train for a 300m swim, 11.2-mile bike ride, and 2-mile run. Compare triathlon training to shopping for a car. You wouldn’t walk into a dealership and pay for a vehicle without taking it for a test drive and checking it out, would you? Same thing for triathlon. See if you like it first! Don’t jump into a full-distance triathlon as your first triathlon. You should understand the training and financial commitment to triathlon training before diving in. That’s why a sprint triathlon is the perfect distance for your first triathlon! 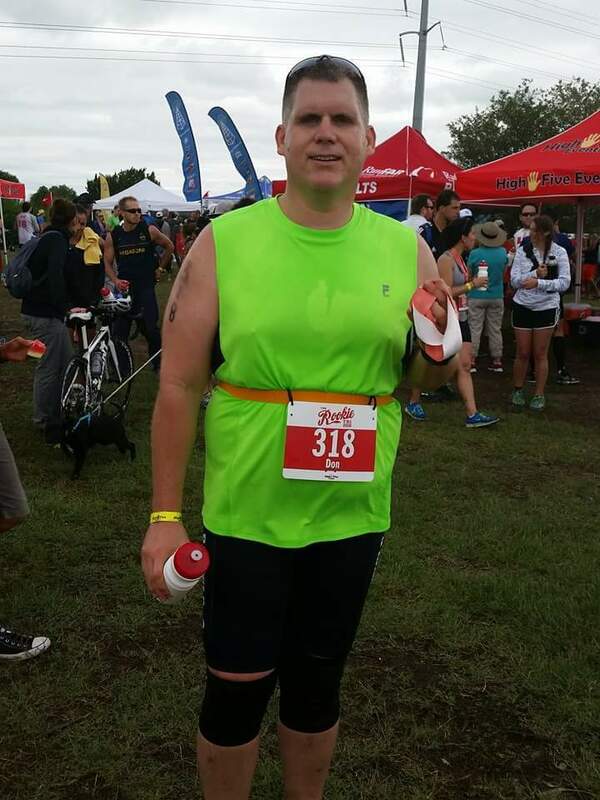 The 2016 Rookie Triathlon (300m swim, 11.2-mile bike, 2-mile run), was my attempt to help a friend, and myself, lose weight. I was 41 and 255 pounds at 6’1.5”. He thought a sprint triathlon would be a fun way to do it since he liked to swim. This probably wouldn’t have been a problem if, 1) we would have decided more than a month before the triathlon was to take place to sign up, 2) I hadn’t just undergone bilateral knee surgeries #4 and #5 six months prior, and 3) if I owned a bike. Don Nolting, Austin Triathlon Club, Ambassador, after 2016 Rookie Triathlon. I was still rehabbing from knee surgery, and given the short time to train, I focused on swimming and riding. While all my doctors discourage running with my knee issues, swimming and biking are highly suggested. The biggest thing for me was to not over train the month before the tri and be so sore and fatigued that I wouldn’t be able to race. Since I knew how to swim, I focused on that. The good news: the swim distance was only 300 meters. I started in the pool and then made sure to swim in a few different open water spots around Austin. Barton Springs became my really cold friend. I was having trouble freestyle swimming, so I focused on the breaststroke and worked on perfecting my form while training. The biking was a whole different beast. I didn’t own a bike when I signed up for the tri. So I took advantage of all of the spring bike sales in Austin. I chose a hybrid bike as a starter bike and got in plenty of rides during the month. I even rode the bike course a few times and struggled some. Since I planned to speed-walk the run, I only worked on increasing my overall fitness for that. In the end, I was pretty happy with where I was feeling after the bike rides, but I wasn’t confident about my swimming. Race day showed up really fast! From a tip I had read on lots of tri websites, I laid out my transition and equipment the night before. I was sure I had everything, but 5:00 a.m. comes early. I was nervous, but the pre-race stretches helped calm my nerves. Waiting in line to get into the water was where the nerves sprung up again. Many of the guys in my age group were nervously chatting about how they hadn’t practiced swimming in open water. I was towards the back of the line going into the water, and I observed people grabbing the lifeguard canoes and the buoys. (* this is legal by USAT rules as long as you do not use the kayak to make forward progress). Practicing breaststroke proved to be beneficial. I don’t think I could have freestyled in that water. I felt good after my swim and was proud I had completed it without taking any breaks or needing any assistance. The path to transition was an uphill path, so I took my time so I didn’t injure my knees at all. Transition went pretty smoothly and I felt good getting onto my bike. The first 1.5 miles went well. However, once I turned into the headwind, it was like I put a sail on my back. I felt like I was going head-first into a wall and barely moving. I was happy to get back to transition, but wasn’t looking forward to the “run.” My legs were gassed, and I hadn’t really practiced going from cycling to a run or walk. Big mistake! That two miles seemed like 20. In addition, it had recently rained, so the course was muddy and changed to include some hills that were rough on my knees. I wasn’t taking any chances with my knees so soon after surgery, so I walked the hills, but (against my doctor’s orders and my better judgment) slow-jogged the flatter sections. Finally coming around the last bend helped me pick up the pace and finish strong. My goal was to finish my first Rookie Tri in 90 minutes, and I missed it by only three minutes. I was tired and sore, but proud that I had finished. Unfortunately, because of knee rehab, it took me about a year to feel right again in order to train for another race. I got back into riding my bike and started swimming again in late 2017. I joined the Austin Tri Club in the spring of 2018 and have really started to push myself and my training thanks to the group. They support and motivate me as I safely train for aquabike challenges (*Aquabike participates complete the swim & bike portion of the triathlon, with their official timing stopping after entering transition after the bike.) and I enjoy cheering on my club-mates as they compete too.